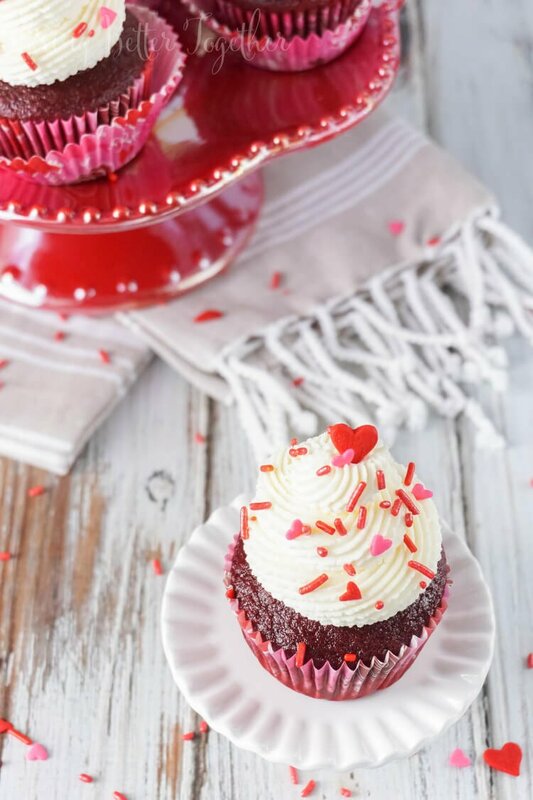 These 5-Ingredient Red Velvet Cupcakes are so easy to make, with a 2-ingredient red velvet base and a 3-ingredient cheesecake frosting, what’s not to love! 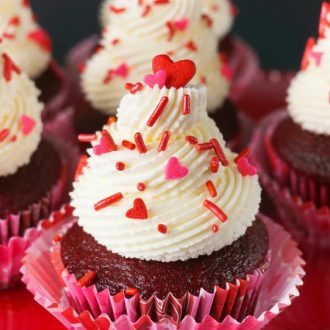 Whip them up for your Valentine in no time! 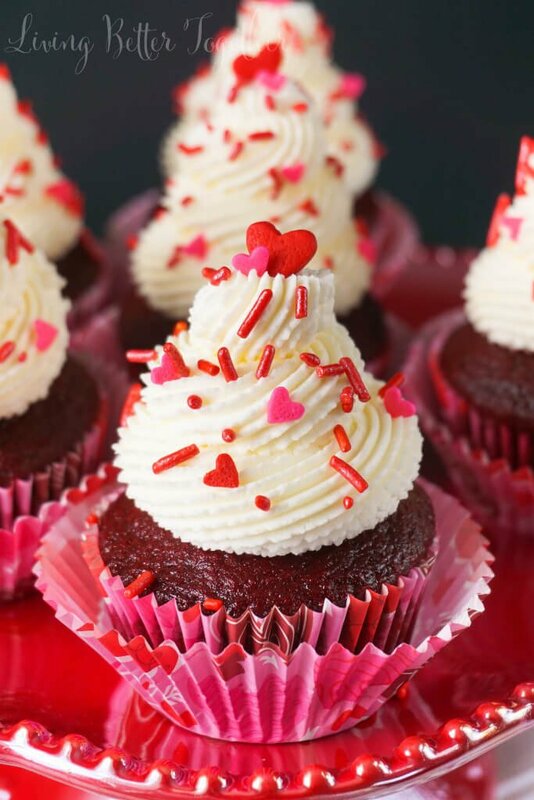 These Red Velvet Cupcakes are made with just five ingredients! FIVE! Can you believe it? They’re the perfect dessert for Valentine’s Day or any other celebration! Red Velvet has never been my favorite, but every now and then, I can’t resist that red fluffy cake topped with cream cheese frosting! Or in this case, whipped cheesecake frosting… YUM! 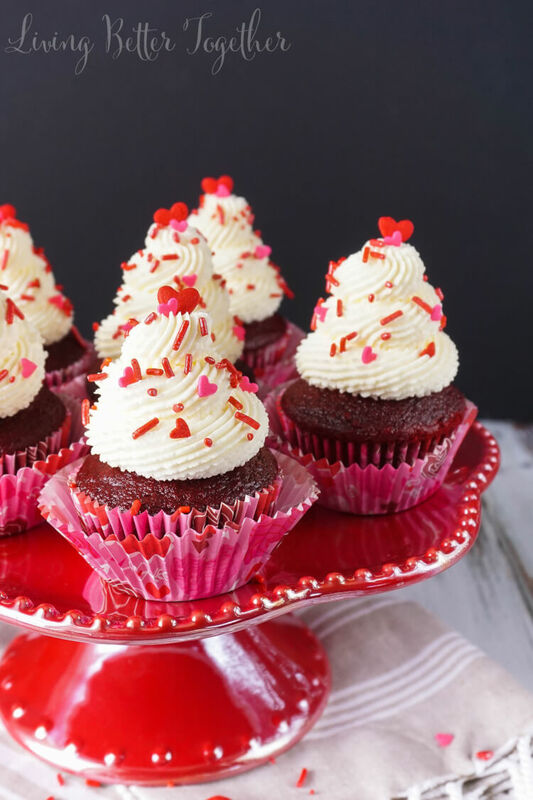 I know I shared some cupcakes on Sunday, but since I didn’t post a single cupcake recipe in January, it’s perfectly okay that I’ve posted two right back to back, right? Did I mention that these are probably the EASIEST cupcakes you’ll EVER make? Yup, just 5 ingredients, and sprinkles for some red velvet heaven! Piping Tip <<< This one if my all-time favorite! Preheat oven to 350 degrees F and line cupcake pan with cupcake liners, set aside. Whisk together cake mix and room temp 7-Up in a large bowl until fully combined and smooth. Fill cupcake liners about 3/4 full of cupcake batter. Bake for 15-18 minutes until toothpick comes clean and cupcake tops spring back when touched. Remove from pan and allow to cool completely on a cooling rack. Combine heavy cream, powdered sugar, and cheesecake pudding mix in a stand mixer and beat in medium-high speed with a whisk attachment until light and fluffy, about 2-3 minutes. You may need to scrape down the sides halfway through. Pipe frosting onto cooled cupcakes and finish off with sprinkles. Minimal ingredients + minimal effort = Lots of YUM! P.S. It’s totally okay to pretend like you spent hours in the kitchen making them when you give them to your Valentine! So, have you got any big plans for Valentine’s Day? It’s kinda nice that it falls on the weekend this year. We’re going to keep it low key with a day at home together. I do have some fun planned for you next week – Date Night Week. We’re talking food, fashion, hair, makeup, and playlists – pretty much everything you need for the ultimate date night! And don’t forget to pick a romantic comedy to curl up on the couch with if you decide to stay in! 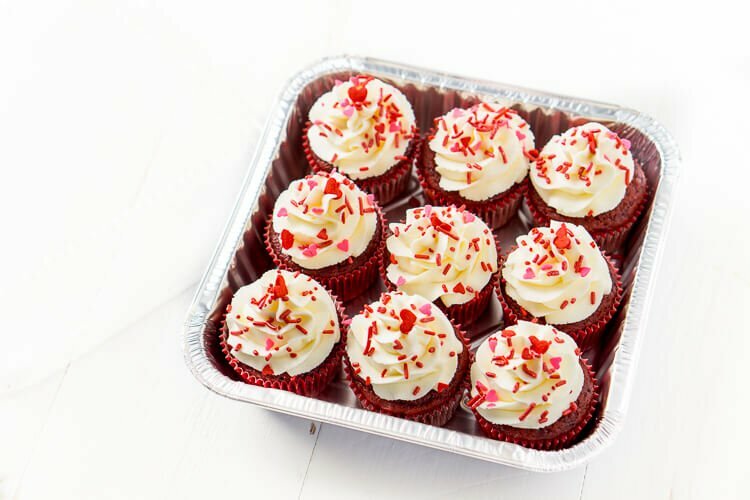 If you need to take these cupcakes on the go for a party, I wanted to share one of my favorite tips with you when it comes to cupcakes. I’m almost positive that I’ve tried every cupcake carrier under the sun and you know what works the best in my opinion? A 9 x 9 disposable cake pan with a dome lid. You can fit 9 cupcakes perfectly in these things and the edges come up high enough to keep them stable and the covers leave plenty of room for that beautifully piped frosting and sprinkles. Plus, since they’re disposable, they’re great for dropping off with the kids at school or parties because you don’t have to worry about getting the containers back! Watch How To Make Red Velvet Cupcakes in the Video Below! 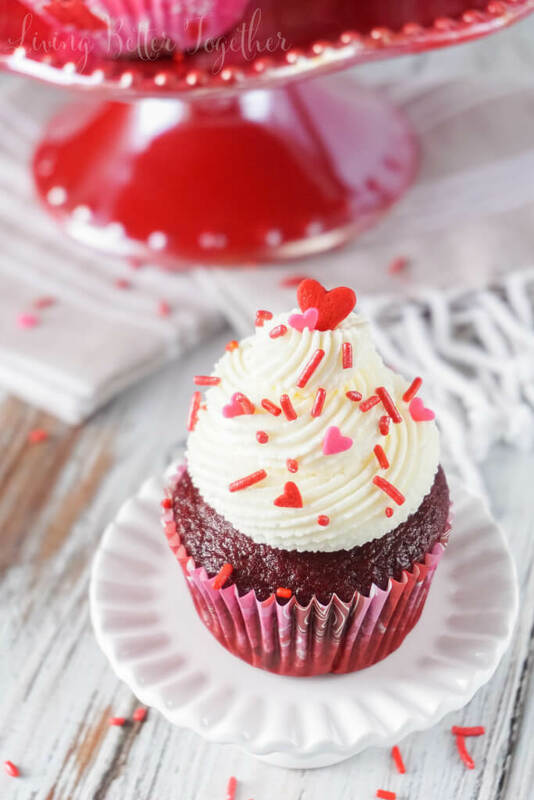 These 5-Ingredient Red Velvet Cupcakes are so easy to make, with a 2-ingredient red velvet base and a 3-ingredient cheesecake frosting, what's not to love! 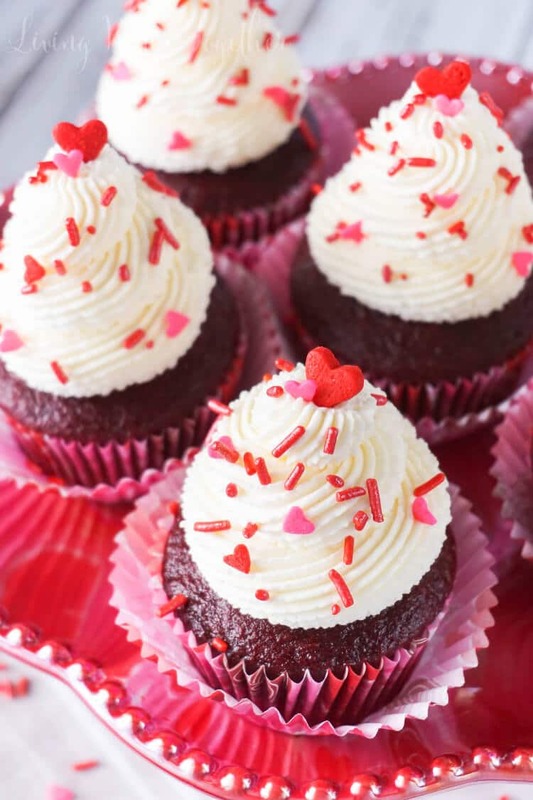 Whip them up for your Valentine in no time! Bake for 15-18 minutes until toothpick comes clean and cupcake tops spring back when touched. Remove from pan and allow to cool completely on a cooling rack. Combine heavy cream, confectioners' sugar, and dry cheesecake pudding mix in a stand mixer and beat in medium-high speed with a whisk attachment until light and fluffy, about 2-3 minutes. You may need to scrape down the sides halfway through. Pin this Red Velvet Cupcakes Recipe for Later! Does this frosting make enough for a two later cake? Hi Elizabeth, You will likely need to double the recipe for a two layer cake, but it really depends on the size of your layers. Thank you so much, that is what I was thinking. Perfect for granddaughters birthday cake request, I’m going to use vanilla pudding because of her flavor request. Doubled fosting, used vanilla pudding more than enough for two layers, would probably do 4. It’s delicious, thank you. If not consuming within a few hours, the frosting should be refrigerated, but is best fresh!